Volvo invented the three-point seatbelt and gave the patent away to save lives. 2. The average Bugatti customer has about 84 cars, 3 jets, and 1 yacht. 3. Top Gear staged breakdowns of the Nissan Leaf and Tesla Roadster, making electric cars seem unviable. Show defenders said that it was all in fun. 4. New Mercedes-Benz cars will play a short blast of white/pink noise just before an unavoidable crash, forcing the occupant's ears to turn off for a moment, preventing the hearing loss normally caused by the crash itself or airbags. 5. The Tesla Model S's roof is so strong that it broke the testing machine used to crush car roofs. Anyone can purchase a Volvo and get a free trip from the US to Sweden to tour the factory and test drive your car in the land that it was built. All costs including airfare and shipping the car to the US are complimentary. 7. General Motors purposely kept the 1979 Chevy Malibu gas tank dangerously close to the rear of the vehicle. Instead of paying an extra $8.59 per vehicle to move the gas tank to a safer location, GM estimated that they would only have to pay $2.40 per vehicle to pay off personal-injury lawsuits. 8. Some people in the USA modify their cars to produce thick black diesel smoke to protest/annoy cyclists and environmentalist. It's called 'Rolling Coal'. 9. An Italian tractor manufacturer was so upset with the bad clutches in Ferrari's cars that he complained to Enzo Ferrari himself, who arrogantly dismissed the concerns. The tractor maker, Ferruccio Lamborghini, decided to make his own cars to compete. 10. The designer of the Porsche 911, Butzi Porsche, was kicked out of industrial design school in his first year for apparent lack of talent. When he went to work for his father at Porsche, the company's design director rejected his ideas, so he had the 911 prototype built by an outside contractor. 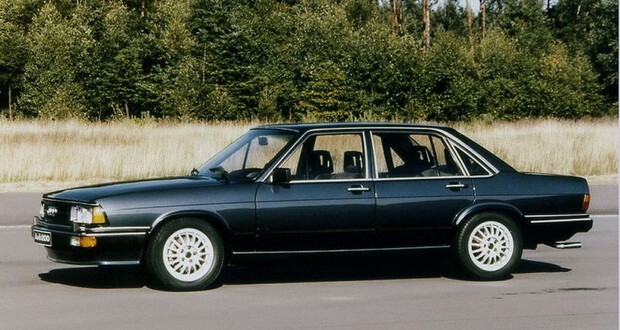 In 1986, '60 Minutes' ran a scathing exposé on the Audi 5000, alleging it could wildly accelerate on its own. However, their on-air demonstration used a rigged car to show falsified results. Government tests later vindicated Audi but their sales had already plummeted. '60 Minutes' never apologized. 12. A study conducted by American University found that the Toyota Camry (78.5%) and the Honda Accord (76%) both contain more domestic content than the 'American' Chevrolet Camaro (68%). 13. President Lyndon B. Johnson owned an amphibious car (Amphicar Model 770) that served as both a vehicle and a boat. He used it to scare guests by driving them into his lake while screaming that the brakes were malfunctioning. 14. The top speed of the Bugatti Veyron is limited not by the engine, but rather by the possibility of the tires exploding. 15. In the 60's Ford was in talks to buy Ferrari but when Ferrari backed out at the last minute it enraged Ford so they built the GT40 to beat Ferrari at Le Mans. It went on to win 4 consecutive times. 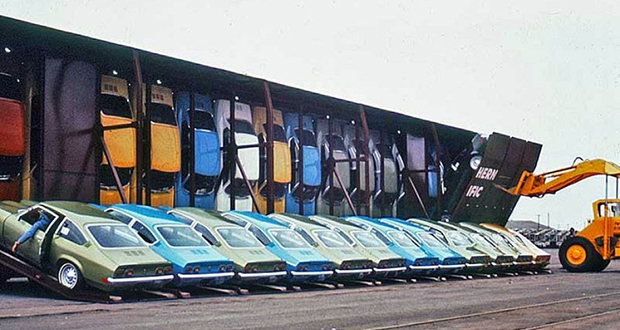 Chevrolet Vegas were shipped vertically in their rail cars. 17. Mitsubishi once offered "0–0–0" financing (0% down,0% interest,$0 in payments the first year). Initially, sales leaped, but many buyers defaulted at the end of the grace period, leaving Mitsubishi with used cars for which they had received no money and were now worth less than they cost to build. 18. Volkswagen owns Audi, Bentley, Bugatti, Lamborghini, Porsche, SEAT, Škoda, Ducati, MAN, and Scania. 19. 3/4 of the cars that Rolls Royce has ever produced are still on the road. 20. Toyota Mirai is one of the first fuel cell vehicles being sold commercially that uses hydrogen to run while emitting water vapor. Electric vehicles predate the Model T, and in the year 1900, comprised 38% of cars on the road. 22. Car tires are black because one manufacturer wanted "more distinguished looking" tires and had carbon black added to the white rubber. The resulting tires lasted 4-5 times longer. 23. Five cow skins are needed for a Porsche interior. Their production amounts to roughly 165,000 cars a year (2013 report). 452 cars per day, 2260 cows a day. 24. "Project sound" is a car suspension system by Bose. It was over-engineered to the point of being deemed unviable commercially, but it outperformed everything on the market. 25. 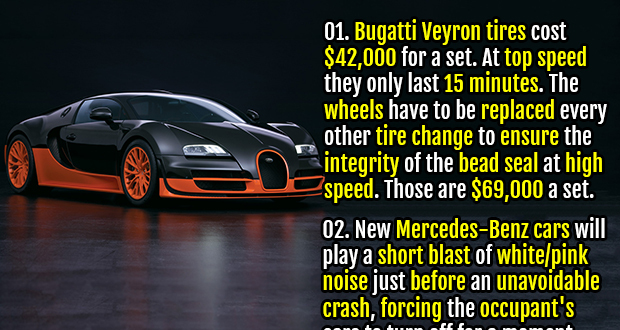 Bugatti Veyron tires cost $42,000 for a set. At top speed, they only last 15 minutes. The wheels have to be replaced every other tire change to ensure the integrity of the bead seal at high speed. Those are $69,000 a set.